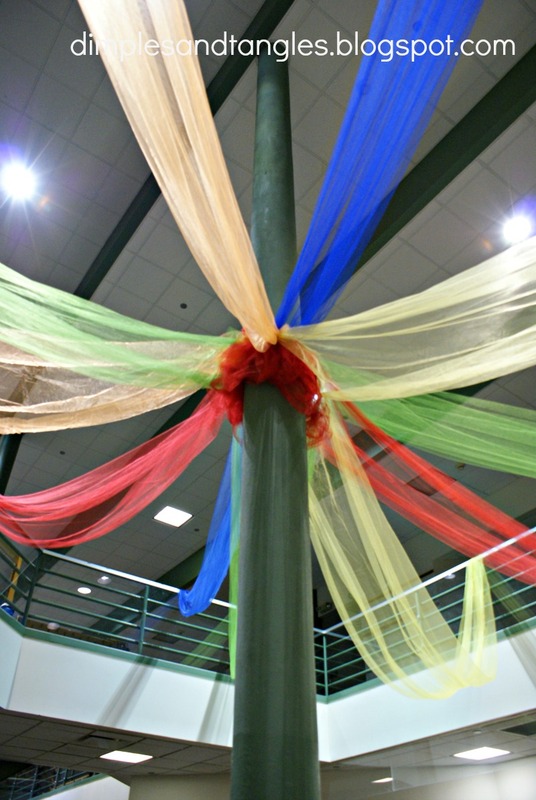 Whenever I help decorate for an event, I like to pass on a few ideas to you all! Sometimes I think it's difficult to find decorating inspiration for big spaces and events that doesn't involve way too much work and $$$. 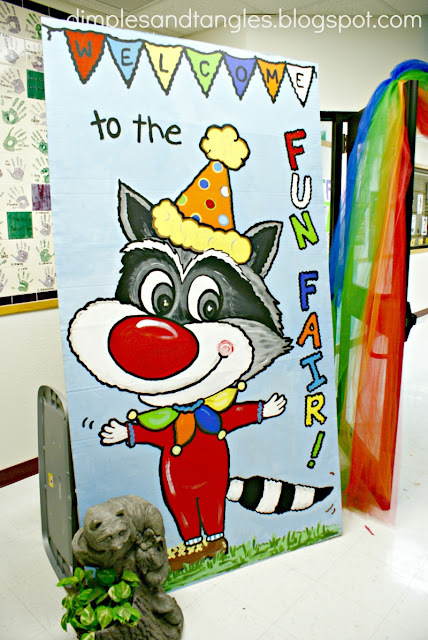 Here are some fairly quick, easy and inexpensive ideas from our school carnival. We've done a carnival theme for our Spring Fundraiser for around the past 5 years, so the beauty is that every year we can build on and tweak the decorations. The first year we started we painted this banner for the stage using an overhead projector. The fabric is just muslin rather than a drop cloth, which is great because it's very thin and lightweight...easy to hang. We didn't want to put pins into the stage curtain, so we used heavy duty bar magnets (about 8 sets across the top) to attach the banner to the valance. I tied the balloons and the strips of tulle together with some curly ribbon and then attached the strips of ribbon with magnets as well. We were already cleaning up before I remembered to snap a few photos, but the curtain was closed during the event so it looked much better. Several years ago we added a "big top" tent in the school commons area with long strips of tulle. We all took turns going to Hobby Lobby with our coupon and buying gobs and gobs of each color. After some trial and error, we've come up with a simple way to hang this tulle. 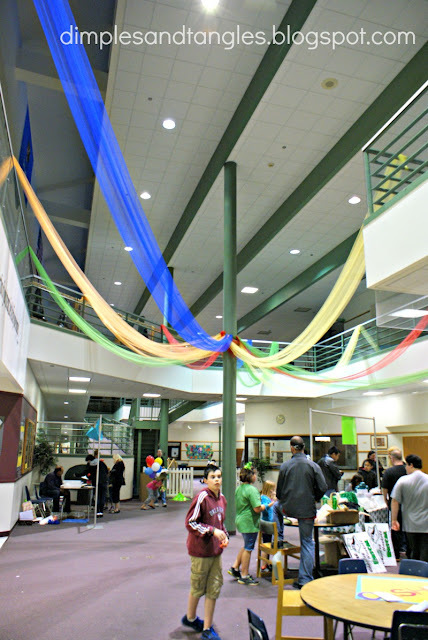 First, we tied an end of each color to the upstairs railing and let the other end drop to the ground. Then, we knotted a thick piece of elastic pretty tightly around the center pole at about our height level. Finally, we gathered up the loose ends on the floor and tucked them through the elastic around the pole, tying the ends together around the elastic to secure them. Using a large ladder, we could easily slide the elastic ring up high, raising the center of the tulle pieces. We tucked an extra piece of tulle around the bottom for a cleaner look. Each year when we're finished we just wrap it all back on the fabric board and store it in a plastic tub, and it's ready to go again for the next year. 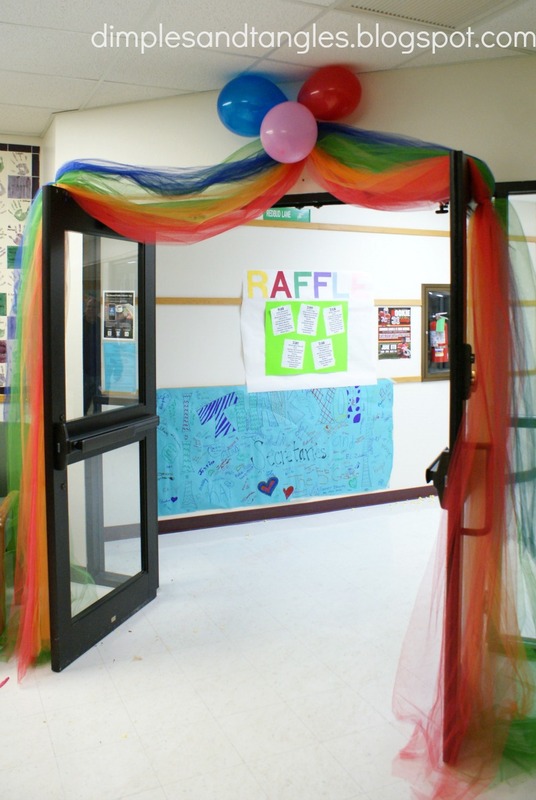 The school entry has a tulle swag also. 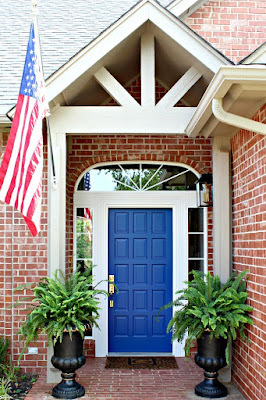 It is tied together in the center and the two sections over the door, and is attached to the wall with a command hook. It draped easily over the doors, but I secured it there with a few pieces of tape. we'll store that away for next year too. Add lots of bunches of helium balloons around the school, and you're good to go! We've used something like my DIY balloon weights before, or this year our coordinator gathered up some pea gravel in ziploc bags, tied the bouquet to it, then we dropped it in a colorful gift sack so it would look cute. Sorry-forgot a photo of that! So, nothing over-blown or extra fancy, but the kids sure did get excited when that "big top" went up, and everyone had fun at the event! So sweet! Love the banner. I should pass this along to my kids pre-school. They always had a carnival end of the year celebration and are looking for new ideas. 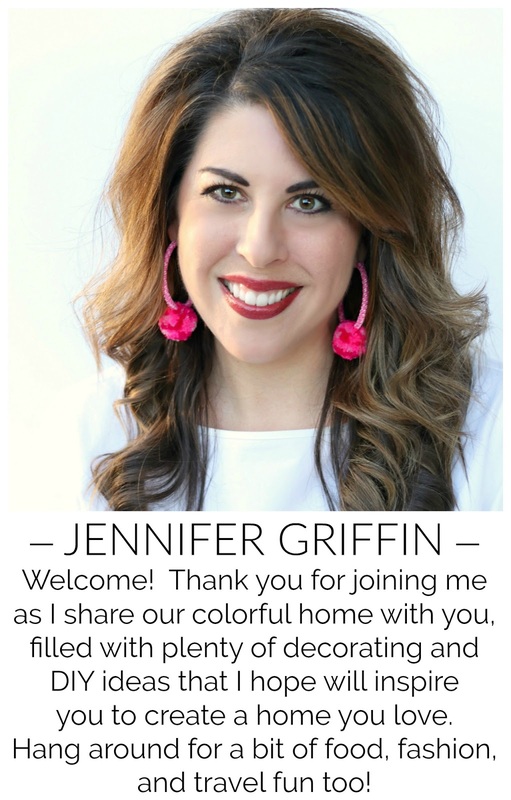 It looks great Jennifer…..I know lots of planning and time goes into an event like that - and all your efforts paid off! Love it! You did an amazing job! Sure miss those days when I would help out at the elementary school :( Now they are in high school and I'm not WANTED as much as before! They grow up so fast! That school is lucky to have you! 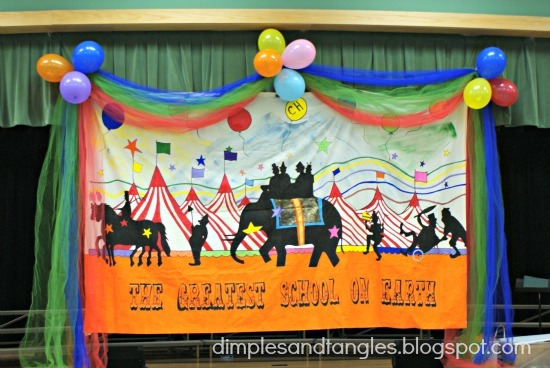 That 'big top' is pure genius! I love it! CLEAN YOUR STOVE BURNERS WITH EASE!